Ad Majorem dei Gloriam! : Speed Racer! I know almost everybody know speed racer right? Yes! the Mach 5 car, this animated cartoon that we watch everyday comes into real life. 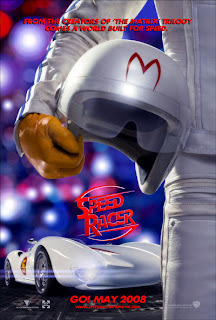 The story begins with Speed Racer who is a young man with natural racing instincts whose goal is to win The Crucible, a cross-country car racing rally that took the life of his older brother, Rex Racer(Matthew Fox). Speed(Emile Hirsch) is loyal to the family business, run by his parents Pops and Mom. Speed's car, the Mach 5 a very special car that designed by his own father. The owner of Royalton Industries makes Speed a lucrative offer, Speed rejects the offer, angering the owner. Speed also uncovers a secret that top corporate interests, including Royalton, are fixing races and cheating to gain profit. In the end the only way that Speed save's his family business is to beat Royalton in his own game. Guyz! Watch the movie, for sure this in another blockbuster movie of the year. May 9,2008! Remember that date.